Who wouldn't want this handsome boy? Why, with those gorgeous, speaking eyes, he could be Waffles' older brother! Yet for some reason, he's one of the kitties who has been at Wayside the longest. We just can't figure this out. "Are you looking for someone extraordinary? Do typical tabbies and pedestrian pussycats make you sigh with ennui as you meet their commonplace green or yellow eyes? If so, I invite you to gaze into my opulent orange orbs. These twinkling topaz gems compliment my gorgeous ginger fur in a way that makes me absolutely unforgettable! As you might imagine, a creature as refined and rare as I am has class and decorum emitting from the proverbial wazoo. I don't jump into the arms of every human I meet but rather delight in the slow blooming of friendship. To be frank, I find humans who hover and grab a bit shocking. Let me get to know you with delicate sniffs of my rosebud nose. Once we have become acquainted, I'll allow you to caress my ears slowly. In time, we will be on lap-sitting terms, having become the best of companions! Naturally, a feline of my class has... certain standards. I don't enjoy associating with uncouth cats and those most vile of barbarians: dogs! If you share my enlightened sensibilities, I implore you to call on me in my chambers here at Wayside Waifs. I'm sure my assistants can pencil in a time for us to meet. 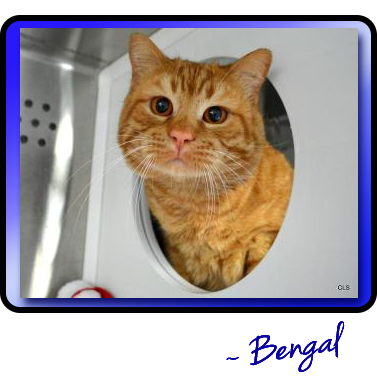 I think Bengal is awesome! Bengal you are adorable. Have a wonderful Wednesday. Look at that face! We can't understand why he's still waiting for his forever home, either, but we're sending our purrs to him that he does find the right human(s) very soon! Um, Mister Bengal, sir... I hope you find a forever home really soon! I just know you'll make someone really, really happy what with all that gingery goodness and all.